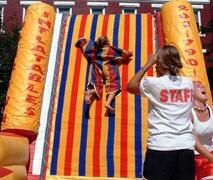 Jump and stick yourself to the giant Velcro Sticky wall wearing our furnished Velcro Suits. It's a blast, you will enjoy telling all your friends all about it! Comes with three suits that fit just about anyone ages 7 and up. This Velcro Sticky Wall is great fun for birthday parties, fairs, family reunions, youth groups and more.